Abd al-Hamed’s irresistibly big smile emanates from deep behind his thick black beard as he finishes telling a funny story. It’s midnight and we are still drinking chai under lamplight in the attractive city-center of Turkey’s western border town, Edirne. Once the capital of the Ottoman Empire, Edirne now sports a delightful clash of 15th century mosques and hip cafes. It is outside one of these busy cafes that five of us – young men from different countries and backgrounds – have come together over chai. Kiyan is on month seven of a lackadaisical bicycle ride from his home in London to Iran – where his only goal is to spend some quality time with his aging grandmother. Coincidently, Xavier has also arrived in Edirne tonight by bicycle. He however, is almost finished with his month-long ride from Zurich to Istanbul. In a couple days he will fly back to Zurich where his university classes have already begun for the semester. I have taken a decidedly simpler journey from my home in the U.S. to Istanbul, via Lufthansa Airlines. Today a comfortable bus carried me the three hour journey west from Istanbul to Edirne – just 20 kilometers from both the Bulgarian and Greek borders. In a couple days I plan to cross the border to Bulgaria and continue wandering across the Balkans as part of my yearly holiday. It was just outside of Edirne that the bus slowed, and I woke from a nap to see media vehicles lining the highway. The object of their reporting lay just beyond them: hundreds of people sitting on blankets spread out across the highway-side embankment. At first glance, one could have been forgiven for mistaking the crowd for Sunday afternoon picnickers. A closer look at their worn expressions and unwashed clothes, however, revealed a different story. “Suriya,” the young Turk sitting next to me, simply stated. At the bus station, and later when I reached the city center, it was the same story: hundreds of migrants from Syria, living in tents, on blankets, sleeping directly on the ground; crowding the bus station and a small pedestrian park beside a city-center mosque. It is in this small park that Abd al-Hamed and quiet friend Ghaith sleep each night. They estimate they share the open-air space with about 400 other migrants. There is no privacy other than a few small tents and a handful of blankets some families have hung to separate themselves from the family beside them. Most people, like Abd al-Hamed and his friends, just spread a mat on the ground and sleep side by side under the relentless city lights. The nearby mosque offers toilet facilities and water for washing. It is English and the common thread of travel that brings us together, really. “Hey, you guys speak English! What are you doing?” queries a friendly Kiyan from across the crowded pedestrian mall. Xavier and I have just met at the hostel and are now in search of dinner in the lively city center. Kiyan had earlier met Abd al-Hamed and Ghaith when he went to investigate what was happening at the crowded park. Now the three of them are also looking for a cheap place to eat. We instantly band together, and four hours later the five of us are still swapping travel stories. Of course, the most poignant stories are shared by the Syrians. Ghaith mostly keeps quiet; a gentle smile and sad eyes revealing more than his mouth. Abd al-Hamed does most of the talking, but both are obviously eager to share stories of their journey from Aleppo to Edirne. “What was Aleppo like?” asks Kiyan. Abd al-Hamed thinks for a moment. “Lots of BBQ parties,” he replies. Abd al-Hamed recalls a time when life was normal. A time when he was studying computer engineering at university with his good friend Ghaith. But all that was before the civil war. Before Bashar al-Assad’s regime began really oppressing the people. Before ISIS. Now life is not normal. Abd al-Hamed’s quiet friend Ghaith, pulls out his smartphone and shows me a YouTube video of what appears to be recorded by someone walking a long boulevard. At the end of the boulevard smoke is billowing out of a tall building. Suddenly a missile crashes into a nearby building and the whole thing explodes in a fiery flash. Between Assad’s regime and ISIS, there is no way to live a normal life in Syria any more, agree Abd al-Hamed and Ghaith. That’s why they have fled. “My family is still in Aleppo,” explains Abd al-Hamed. “It is too much money to come to Turkey.” As Abd al-Hamed explains it, the Turkey-Syria border is officially closed, but if one has enough money, they can bribe their way across the border. For $200-$300, Turkish fixers with connections to the border guards will arrange a crossing. Abd al-Hamed made his way to Istanbul where he found a job that put his degree to use. For the past year he has worked at a computer repair company performing data recovery. However, he claims he was treated poorly by his employer and was having a difficult time living on his minimum wage salary of about $270 per month. By contrast, neighboring Greece has a monthly minimum wage of about $700, while Luxembourg sports Europe’s highest minimum wage at more than $2000 per month. That’s why Abd al-Hamed is now sleeping in a refugee camp in Edirne. He, along with thousands of other refugees are amassing at this border crossing with hopes of making it first into Greece, then further into the European Union. Personally, Abd al-Hamed has set his sights on Luxembourg. “Most people want to go to Germany; I want to go to Luxembourg,” he says. He already tried once. Just recently Abd al-Hamed walked a risky 100 kilometers “through the forest” across the Turkey-Greek border. All he had to sustain himself were a couple Snickers bars. “All you need is one Snickers. It is best energy!” Abd al-Hamed happily reveals with a massive grin. In Greece, he tried to board a train at the first town he entered. Walking up to the ticket counter, Abd al-Hamed smiled his big sheepish grin and asked for one ticket. The ticket agent looked at him suspiciously and asked for a passport. “Ummm…. I don’t have a passport!” he exclaimed and broke out into another sheepish grin. Abd al-Hamed looked around the station and noticed there were soldiers everywhere. Suddenly he felt scared. A police car was called, and Abd al-Hamed was taken to jail for the night and the next day deported back to Turkey. “In jail they made me pay 5 Euros for one piece of food. Five Euros, and they take all the paper off the food. If you keep any paper from Greece, then you can show the UN you go to Greece. They aren’t supposed to send you back to Turkey. But they do. Everything 5 Euros. One Coke, 5 Euros,” he rambles on. Speaking of Coca-Cola reminds Abd al-Hamed about a neat trick he learned in Syria during confrontations with Assad’s soldiers. “Coca-Cola is good!” he exclaims, his eyes sparkling. “You can put it in your eyes when the police make tear gas. Very good. No more crying.” He makes a mental note to be sure to bring Coca-Cola with him the next day during a planned mass march to the Greek border – in case the police bomb them with tear gas, he explains. The plan is for a delegation from the camps to leave at 3am the next day for Ankara, Turkey’s capital, in a bid to meet with leaders. The delegates will try to convince national leadership to come to an agreement with Greece to open the border. Later in the day, about 5000 refugees from the camps around Edirne will start a mass march along the 20 kilometers to the Greek border. “I am climbing fence and sniper shoots at me. But I eat Snickers! So I catch bullet and throw it back at sniper,” he laughs like a silly kid. While most of our talk is light-hearted banter, a strong sense of solemnity pervades all our thoughts. Xavier, Kiyan and I have willingly left our respective home countries to temporarily travel other lands, but these new Syrian friends of ours have left their homeland out of desperation; perhaps never to return. The thought penetrates our emotions. I, not knowing what else I can do, buy all the guys dinner. Xavier, in a touching gesture, offers his touring bicycle to Abd al-Hamed if it will help him on his journey deeper into Europe. “When you see people traveling out of need, and you are traveling for fun… It makes you feel really bad,” Xavier later confides to me. Kiyan simply disappears into a mini-mart and soon returns with a box full of Snickers bars. Twenty-four hours later I read on the news that Turkish police have blockaded the highway to Greece to prevent a group of about 5000 migrants from marching toward the border. I think of Abd al-Hamed and Ghaith, and hope they have enough Snickers for the journey. One small idea can make a big difference! 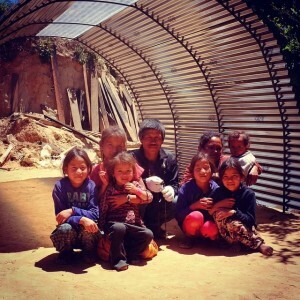 Right after the big earthquake rocked Nepal on April 25th, I shared plans for a corrugated metal roofed shelter design that I had worked with in Pakistan in 2010. The design and “how-to-build-it” pictures that I posted on Facebook got shared widely, and soon several groups in Nepal were producing and distributing very similarly designed transitional shelters. 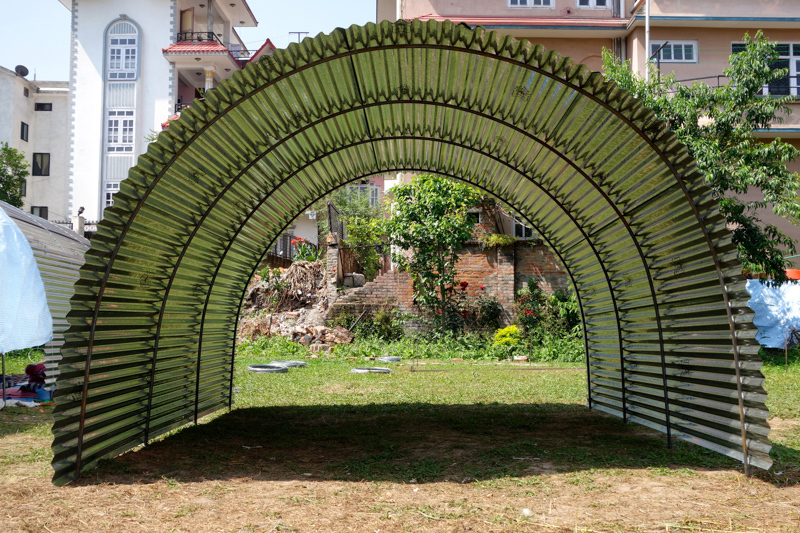 I spent the month of May working with my good friends at Portal Bikes, in Kathmandu, prepping materials for and distributing these shelters. Four weeks later we had supplied 1000 homeless families with transitional shelters and trained several other groups to do the same. 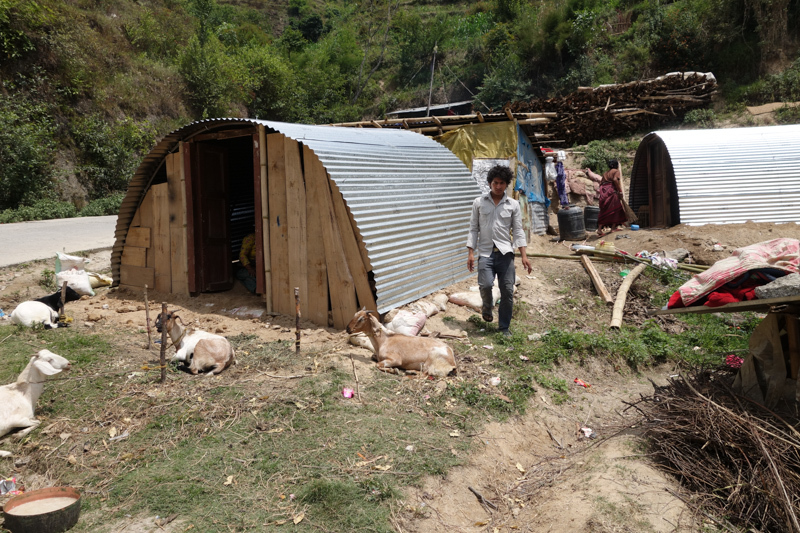 Right now, these transitional shelters can be seen all over the affected districts of Nepal, with happy occupants praising their weatherproof livability. By my estimates, around 3000 of these shelters have been deployed by now, and more are going up all the time. Even Newsweek got wind of the impact these transitional shelters are making on Nepal and featured them in the June 05 edition. The power of working together! Thanks to your contributions and all the many different grass-roots relief groups, NGOs, individuals, and businesses that are working together in Nepal right now, shelters are getting to the people who need them the most! Thanks to your generous donations, so far Over The Edge Travel has been a personally provide 35 homeless families with shelter! That’s the power of working together. Let’s keep working together as we transition from relief to rebuilding Nepal. After the monsoon, people will be rebuilding their homes, schools, and villages. Over The Edge Travel would love for you to join us as we partner with local organizations to support rebuilding initiatives. Now, more than ever, Nepal needs you to visit. Nepal’s economy relies heavily on tourism. The best way you can help the country right now is to take that long awaited trip to Nepal! Resuming in October, I will be leading incredible trips through Nepal, focusing on the beauty of the country and culture. For those interested in contributing a little more to the rebuilding process, Over The Edge Travel will also be partnering with local organizations on rebuilding projects in affected areas, and you could become a part of that! Due to the very alarming media coverage post earthquake, many people are understandably concerned about traveling to Nepal now. The reality is that while certain districts were badly affected, others were unaffected. I will be closely monitoring the situation in Nepal and following the advice of third party experts who will assess the risks of traveling in certain areas. Over The Edge Travel trips will on ly travel in areas deemed stable and safe. By October, most of the major infrastructure surrounding tourism should be restored to normal. While much of the country is struggling to cope with the damage, the loss, and pain, other people have moved on with life as normal. To visit Kathmandu now, you may not know that there had ever been an earthquake until you visit a neighborhood that suffered much damage and has yet to be cleaned up. 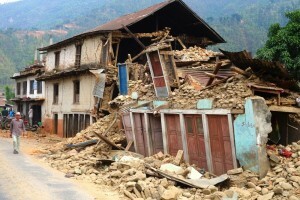 Over The Edge Travel has partnered with Portal Bikes and Five14, two trusted organizations on the ground in Kathmandu, to provide temporary shelters and rebuilding supplies to mountain communities that are being overlooked by larger aid organizations. 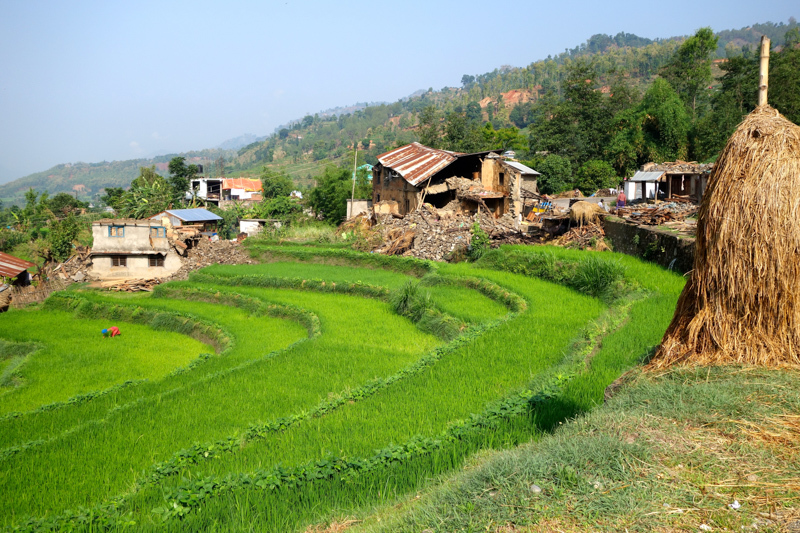 In the mountainous districts most badly affected by the earthquakes, there are entire villages completely demolished by the recent earthquakes. With the monsoon rains quickly approaching, those whose homes have been destroyed are in desperate need of shelter. That is why Over The Edge Travel has partnered with Portal Bikes and Five14, to provide shelters for the monsoon, followed by long term, sustainable rebuilding solutions for the future! Over The Edge Travel and Portal Bikes are coordinating efforts to equip locals and other aid organizations to provide sturdy relief shelters to villagers whose homes have been destroye d.
These simple, cost effective, but very livable shelters will get the homeless out of the rain while they rebuild their homes and villages. Using locally available resources, we can provide a sturdy all-season shelter for a family for about $110. All donations through Over The Edge Travel go directly toward supporting relief and rebuilding efforts. Over The Edge Travel is supporting Five14 to bring relief supplies and resources for rebuilding to mountain communities that are cut off from aid by landslides and difficult terrain. Five14 is working closely with village leaders to assess essential needs and provide relief in a systematic and efficient method. Without their action, these mountain communities would likely have no access to aid. 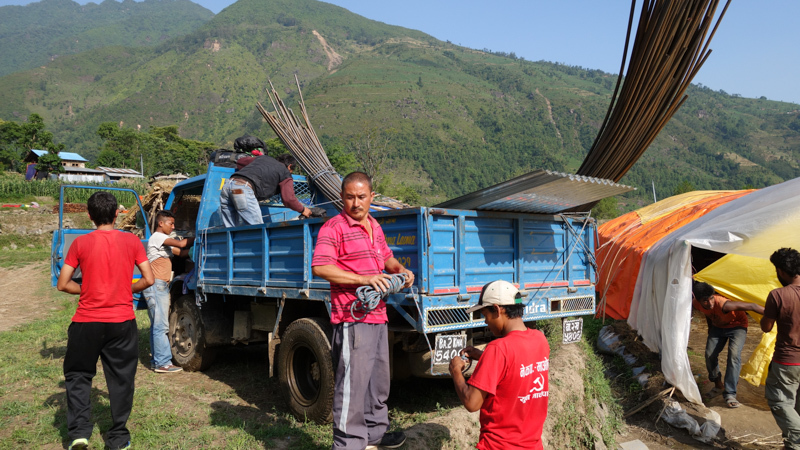 Five14 has already distributed truckloads of food and tarps, and is now working on providing sustainable jobs and innovative rebuilding techniques for villagers whose homes have been destroyed.